Make sure to take some time over the weekend to check out their displays, and make sure to visit the actual Hall Of Heroes Museum when in Elkhart, Indiana! 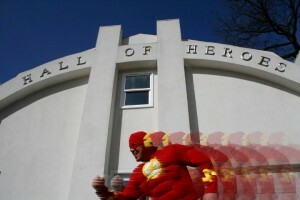 Hall of Heroes is the only Super Hero and Comic Book Museum in the world. We cover the entire 75 year history of Super Heroes in Comics, Toys, Film and Animation. Hall of Heroes is in a 2 story replica of The Hall of Justice from the classic Super Friends cartoon. 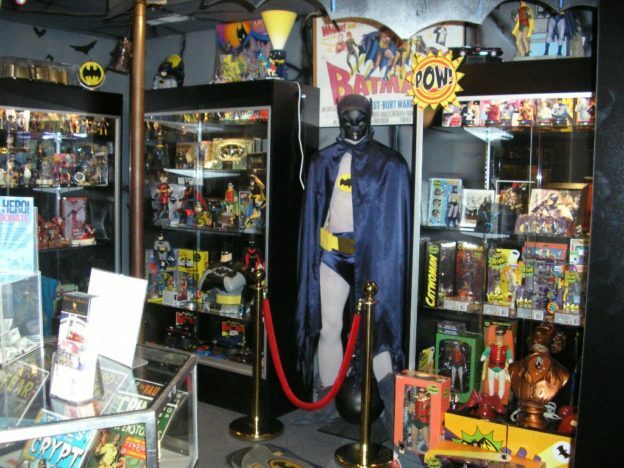 We also feature a replica of the Bat Cave set from the 1960′s television series along with Adam Wests original Batman Costume on display WOW!!! You can see the original Shield used in the film Captain America: The First Avenger on display in our Hollywood Heroes section. We also feature the Golden Age Era of Comics 1938-1955 and a Captain America #1 from 1941 on display along with many other great comics and toys from the WW II era. Our Silver Age Era from 1956-1969 includes all of the 1st Marvel Comics as well as several rare tin toys from this era including the rare Marvel Super Hero Express tin train. These are just a few of the rare items you will see here at our museum which features over 60,000 comic books, 10,000+ toys, figures and props and over 100+ pieces of original art comic pages and animation cells from your favorite cartoons and comic books.